Simple and quick set up. Wall, table, or ceiling mount. Connect with Wifi or with Lan Cable. 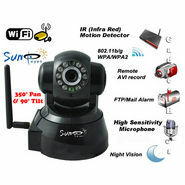 Motion Detector with email or alarm. Remote viewing and video recording from any internet connection. View and control from mobile phone. Remote controlled (from a browser). Multi-level Users: access and management. Day and Night vision with 10 IR LEDS (night visibility up to 10 meters). Remote Pan/Tilt control (Pan - Horizontal 350 Degree and Tilt - Vertical 90 Degree). Wireless or wired connection to modem/router. Wi-Fi certified. Complaint with IEEE 802.11b/g. Standard MJPEG image compression format. View at variable frequency: 50 Hz, 60 Hz or outdoor. Image resolution: VGA (640 x 480) / QVGA (320 x 240). Dimensions: Length x Breadth x Height: 100 mm x 100 mm x 120 mm.